The Leela Palace, Goa just 50 minutes by Air from Mumbai (Bombay) and a scenic drive through lush coconut groves will bring you to the southern tip of Mobor Beach where the idyllic and peaceful resort awaits you. 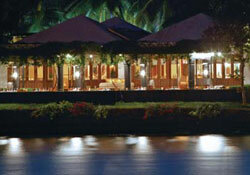 The Leela Palace, Goa has a unique position both geographical and historical. It is located halfway down India's west coast and is enclosed by the Western Foothills and the Indian Ocean. An unusual blend of eastern and western culture is evident here in everyday life, derived from a history of Portuguese rule that spans more than 450 years. Enjoy the unhurried pace of life, wander along miles of sun-kissed white beaches fringed by palms and caressed by the warm waters of the Arabian Sea. * Bidar and Badami, besides a number of outdoor venues as well as the famous beach front of Goa. The land of sunny beaches and smiling people, Goa sums up everything that deals with fun, frolic and laughter. A perfect place for tourists from all across the world, a tour to Goa is often the world’s most favorite holiday destination.